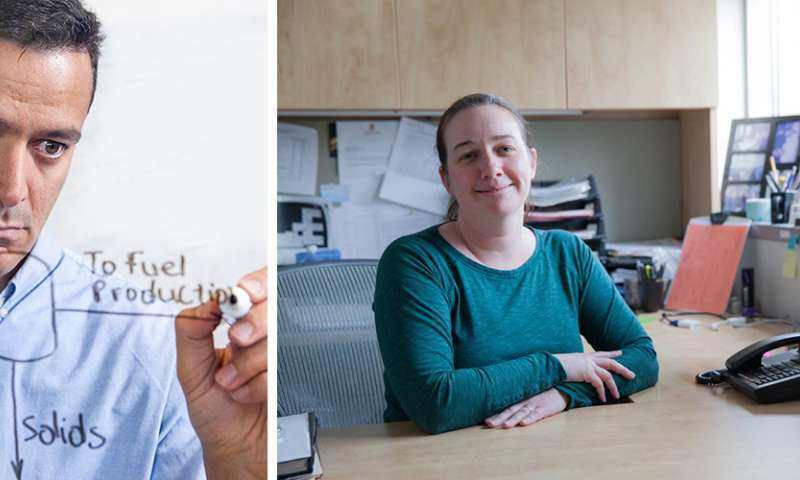 GLBRC researchers Christos Maravelias (left) and Jennifer Reed (right) collaborated on a recent publication identifying potentially profitable bioproducts. The study's first author, Tony (Wenzhao) Wu, is pictured below. As researchers at the Great Lakes Bioenergy Research Center (GLBRC) work toward that vision, they're finding inspiration in what might seem an odd or unlikely place – the oil refinery. Oil refineries make an array of products from crude oil, including low-cost gasoline and high-value petrochemicals. The practice of making co-products alongside fuels helps improve the refinery's bottom line and could also prove critical to the biorefinery's economic model. "We wanted to develop methods that will allow us to identify chemicals that will be promising in a biorefinery," says Christos Maravelias, University of Wisconsin–Madison professor of chemical engineering. "This means taking into account what can be done biologically and also taking into account the price of chemicals in the market." Video Highlight from Wenzhao Wu et al on the recently published B&B paper titled "A Framework for the Identification of Promising Bio-Based Chemicals." Maravelias, along with Associate Professor of Chemical Engineering Jennifer Reed and the study's first author Tony (Wenzhao) Wu, has developed and used a multi-scale modeling process to identify 32 biochemicals as economically promising if maximum yields can be achieved, and 22 biochemicals if the maximum productivities can be achieved. "It doesn't mean that if we produce that chemical today on an industrial scale, it will be profitable," Wu says of the bioproducts identified. "But it means it can be profitable in the future if the microbial conversion yield and productivity can be increased drastically and low separation cost can be achieved." The work provides immediate guidance for microbiologists and chemical engineers, steering them toward the production of biochemicals most worthy of time and investigation. As Wu says, "we don't want to use our valuable resources to study chemicals that don't appear to be promising." But it's also a flexible framework for answering other complex questions about the biology and economics of specific biochemicals and can be used to conduct other customized screenings. "This is a starting point," says Wu, "a model that combines what we know to be true about the microbial processes that generate these chemicals with what we know about the economics. Our final goal is to inform future research."